The agriculture in Thailand is highly competitive, diversified and specialised and its exports are very successful internationally. Rice is the country's most important crop. Thailand is a major exporter in the world rice market. Rice exports in 2014 amounted to 1.3 percent of GDP. 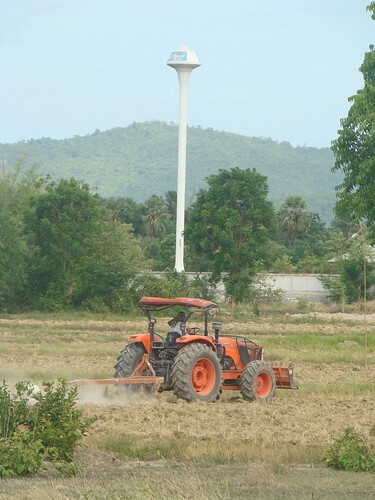 Agricultural production as a whole accounted for an estimated nine percent of Thai GDP and 40 percent of the population works in agriculture-related jobs. Other agricultural commodities produced in significant amounts include fish and fishery products, tapioca, rubber, grain, and sugar. Exports of industrially processed foods such as canned tuna, pineapples, and frozen shrimp are on the rise. ​Laos, officially the Lao People's Democratic Republic, or commonly referred to its colloquial name of Muang Lao is a landlocked country in the heart of the Indochinese peninsula of Mainland Southeast Asia, bordered by Myanmar (Burma) and China to the northwest, Vietnam to the east, Cambodia to the southwest, and Thailand to the west and southwest. Present day Laos traces its historic and cultural identity to the kingdom of Lan Xang Hom Khao (Kingdom of a Million Elephants Under the White Parasol), which existed for four centuries as one of the largest kingdoms in Southeast Asia. Due to Lan Xang's central geographical location in Southeast Asia, the kingdom was able to become a popular hub for overland trade, becoming wealthy economically as well as culturally. After a period of internal conflict, Lan Xang broke off into three separate kingdoms— Luang Phabang, Vientiane and Champasak. In 1893, it became a French protectorate, with the three territories uniting to form what is now known as the country of Laos. It briefly gained independence in 1945 after Japanese occupation, but returned to French rule until it was granted autonomy in 1949. Laos became independent in 1953, with a constitutional monarchy under Sisavang Vong. Shortly after independence, a long civil war ended the monarchy, when the Communist Pathet Lao movement came to power in 1975. Laos is a one-party socialist republic. It espouses Marxism and is governed by a single party communist politburo dominated by military generals. 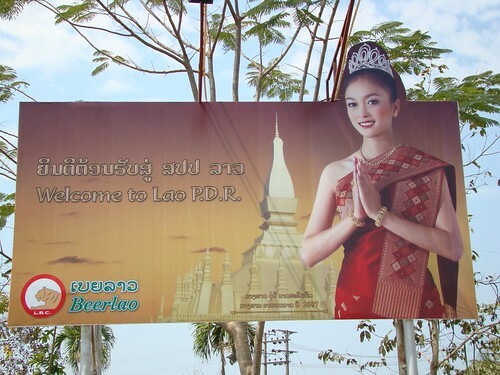 The Socialist Republic of Vietnam and the Vietnam People's Army continue to have significant influence in Laos. The capital city is Vientiane. Other large cities include Luang Prabang, Savannakhet, and Pakse. The official language is Lao. Laos is a multi-ethnic country with the politically and culturally dominant Lao people making up approximately 60 percent of the population, mostly in the lowlands. Mon-Khmer groups, the Hmong, and other indigenous hill tribes, accounting for 40 percent of the population, live in the foothills and mountains. 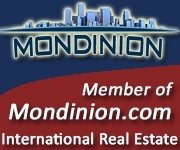 The tourism sector has grown rapidly, from 80,000 international visitors in 1990, to 1.876 million in 2010. Tourism is expected to contribute US$679.1 million to the gross national product in 2010, rising to US$1.5857 billion by 2020. In 2010, one in every 10.9 jobs was in the tourism sector. ​Patuxai (Lao: ປະຕູໄຊ, literally meaning Victory Gate or Gate of Triumph, formerly the Anousavary or Anosavari Monument, known by the French as Monument Aux Morts) is a war monument in the centre of Vientiane, Laos, which was built between 1957 and 1968. The Patuxai is dedicated to those who fought in the struggle for independence from France. In romanising the name from the Laotian language, it is variously transliterated as Patuxai, Patuxay, Patousai and Patusai. 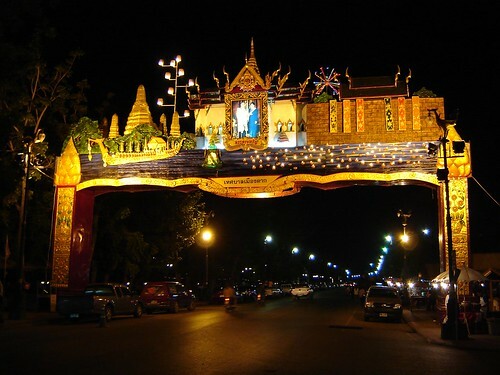 It is also called Patuxai Arch or the Arc de Triomphe of Vientiane as it resembles the Arc de Triomphe in Paris. However, it is typically Laotian in design, decorated with mythological creatures such as the kinnari (half-female, half-bird). Patuxai is a compound word, ‘Patuu’ or ‘patu’ meaning a “door” or “gateway” and ‘Xai’, derivative of the Sanskrit ‘Jaya’, which means “victory”. Thus it means “Victory Gate”. The Patuxai was built during a turbulent period Lao history. 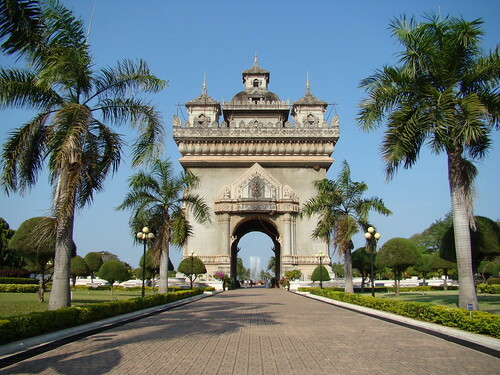 It was built when Laos was a constitutional monarchy and was originally known simply as the "Anousavali" ("memory"), dedicated memory of the Laotian soldiers who died during World War II and the independence war from France in 1949. The next level is an open space where four towers are built at the four corners. These towers have been decorated with frescoes of foliage. The towers are also fitted with electric lights, which are switched on during the national day and other important festivals. The small towers, with temple like ornamentation, are designed in the Laotian style and are provided with spires. Each tower has a stairway. Apart from the four corner towers, there is another central larger tower above this floor, which also has a staircase which leads to the top floor that has the viewing platform from where a panoramic view of Vientiane could be seen. A telescope is also fitted at that level to get a view of the city. 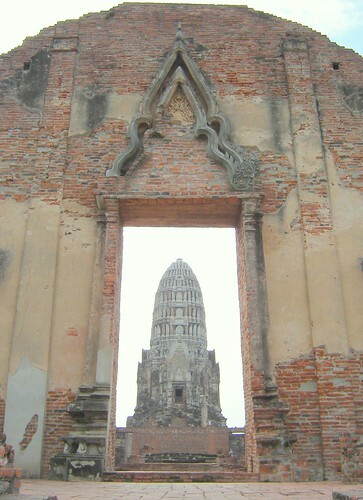 The monumental building is not fully finished to this day, although the Laotian government have repeatedly authorized new funds. Wat Ratchaburana was founded in 1424 by King Borommarachathirat II of the Ayutthaya Kingdom and built on the cremation site of his two elder brothers. The two brothers had fought to their deaths in a duel for the royal succession to their father Intha Racha. In 1957 the temple's crypt was looted of a large number of Buddha images and gold artifacts. The thieves were later caught, but few of the treasures were recovered. Some that were recovered are now housed in the nearby Chao Sam Phraya Museum. Subsequent excavations of the crypt have uncovered many more rare Buddha images. 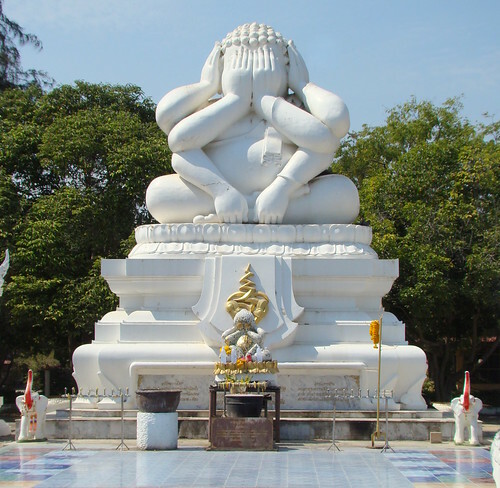 The temple's central prang has undergone restoration. Original stucco work can be seen, for example Garuda swooping down on nāga. Other mythical creatures as well as lotus are featured. Four Sri Lankan stupas surround the main prang. The prang's crypt, accessible by steep stairs, houses faded frescoes. These comprise some of the rare such examples from the early Ayutthaya period. The crypt's Buddha images, now housed in the Chao Sam Phraya Museum, exhibit both Khmer and Sukhothai influences. Tak is one of the western provinces (changwat) of Thailand. Neighbouring provinces are (from north clockwise) Mae Hong Son, Chiang Mai, Lamphun, Lampang, Sukhothai, Kamphaeng Phet, Nakhon Sawan, Uthai Thani and Kanchanaburi. The western edge of the province has a long boundary with Kayin State of Myanmar (Burma). 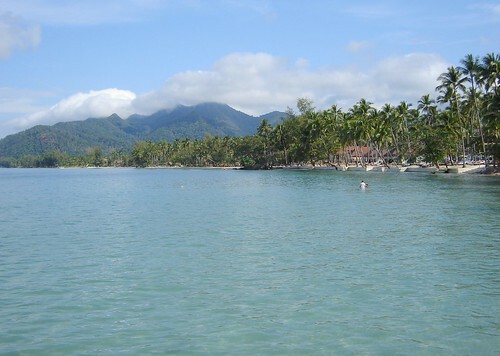 Phe to the island's closest tourist beach is about 10 km. In 1981, the Royal Forest Department declared the archipelago of Samet, along with nine other small islands, the headland of Khao Laem Ya, and the 11 km Mae Ramphueng Beach to be a national park, and thus Ko Samet is under the protection of the National Parks Division of the Thai government.